FILE - Dominican Republic President Danilo Medina speaks at the opening ceremony for the first China International Import Expo (CIIE) in Shanghai, China, Nov. 5, 2018. Dominican President Danilo Medina met Chinese Vice Premier Hu Chunhua on Monday, the president's office said, deepening ties between the countries as the United States warns governments in the region against getting too close with China. "The representatives of the Chinese government emphasized the interest they have in supporting the (Dominican Republic) in increasing its exports to China and promoting a greater flow of tourists from that nation to ours," the Dominican government said in a statement. 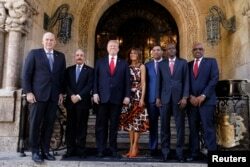 U.S. President Donald Trump and first lady Melania Trump pose with Saint Lucia Prime Minister Allen Chastanet (L), Dominican Republic President Danilo Medina (2ndL), Jamaica's Prime Minister Andrew Holness (3rdR), Haiti's President Jovenel Moise (2ndR), Bahamas Prime Minister Hubert Minnis (R) and other leaders prior to a working visit at Mar-a-Lago in Palm Beach, Florida, March 22, 2019. The White House had said earlier in the week that Trump wanted to work with leaders to "counter China's predatory economic practices." The United States and China are embroiled in trade disputes, with talks to resolve them apparently in the final stages.